Have this Savory Bread Pudding for a beautiful and hearty breakfast in bed. Made with the classic ham and cheese flavor combination - an all-around favorite. Preheat the oven to 350 / 175 degrees. Lightly oil a 10-inch x 10-inch (23-cm x 23-cm) or a 9-inch x 13-inch (23-cm x 36-cm) baking dish. Cut the bread into 1-1/2-inch cubes. Set aside in a large mixing bowl. In a skillet, heat the olive oil over medium heat. Add the shallots and saute until softened, about 5 minutes. Remove from heat and set aside. In a medium mixing bowl, beat the eggs. Whisk in the salt, milk, cream, pepper and nutmeg. Pour the egg mixture over the bread. Add in the shallots, ham, thyme and 3/4 cup of cheese and mix well. Allow the mixture to sit for about 5-10 minutes for the bread to soak in the custard. Carefully tip everything into the prepared pan. The custard should come up to the top of the pan, but a few pieces of bread should be sticking out. Sprinkle 1/2 cup of cheese on top. Grind a little black pepper on top. Bake in the center of the oven for about 1 hour. The bread pudding is done when the custard is set and no longer runny in the middle. Test it by sticking in a butter knife in the middle to check the texture. If the top of the bread pudding gets too dark before the custard is set, cover with a piece of foil and continue baking. Recipe adapted from the Tartine Cookbook. 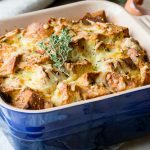 Get this recipe for Savory Bread Pudding - Ham and Cheese Classic at https://www.theworktop.com/breakfast-brunch-recipes/savory/savory-bread-pudding-ham-cheese/.